My mom's visiting this week, pretending like she's mildly interested in me even though we all know she's only interacted with my 2-year-old Otto since she's been here. Still, she did do one very motherly thing for me: she brought me my old Tonka Super Beetle, the toy that made me love cars. I was really little when I got this — maybe 5 or so? 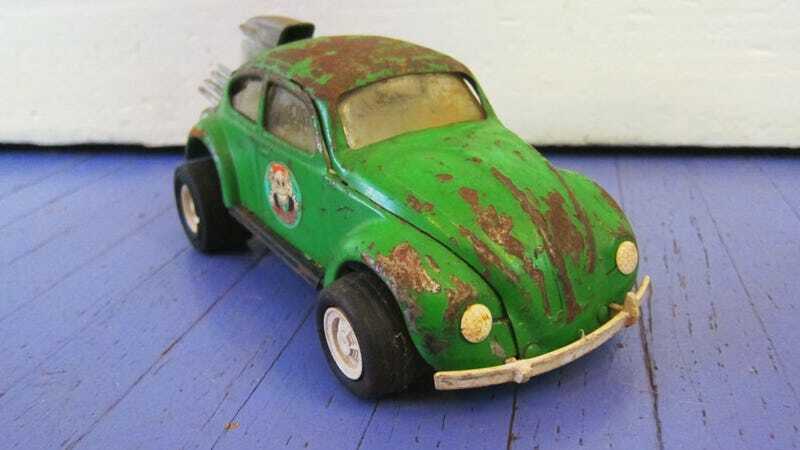 This green Beetle was a constant in my outdoor playing, as the well-abraded paint shows. This may be the thing that cemented my love for VW Beetles; well, this and my dad's brick-red '68 Autostick Bug. The goofily oversized engine at the rear had lots of pulleys and scoops and fins to fire up my curiosity about just what was going on back there, and the cute-but-tough look of the whole car still defines what I find appealing in cars today. I'm quite happy to have it back. I want to preserve it in exactly this state of wear, which may mean Otto won't get to play with it. Which may mean I'm a monster, but, well, there's always eBay. What toy started you down this oily path of gearheadom? Show us!